A variety of dining options fill the lavish concourse inside The Bank. One of downtown Sacramento’s landmark structures, the grand D.O. Mills Bank Building on the corner of Seventh and J streets, has been given new life as a snazzy food hall-style destination called The Bank. When all of the kitchens are finally built out, patrons will be able to dine at any of several independently owned eateries, including a pizza restaurant, a poke bar, a street-taco joint and a quick-service cafe serving Chocolate Fish coffee and treats from Conscious Creamery, Boy’s Bakery and Sweet Dozen. New versions of established outfits like Preservation Kitchen & Market, Mama Kim’s and Station 8 (from the owners of downtown’s Station 16 seafood restaurant) are also part of the dining offerings. “We truly envision this as a choose-your-own-adventure kind of a place,” says spokesperson Patrick Harbison. “You can grab a casual lunch, meet for dinner or attend an extravagant private party. There’s really something for everyone.” All of the food vendors will be locally owned. The imposing century-old building boasts three watering holes, each with its own distinctive personality: the concourse bar, a fast-casual spot where patrons can grab a beer or a cocktail before a game; the mezzanine bar, a swank hideaway with high-end craft cocktails and top-tier liquors; and the beer vault, a subterranean self-service tap room with 68 taps. 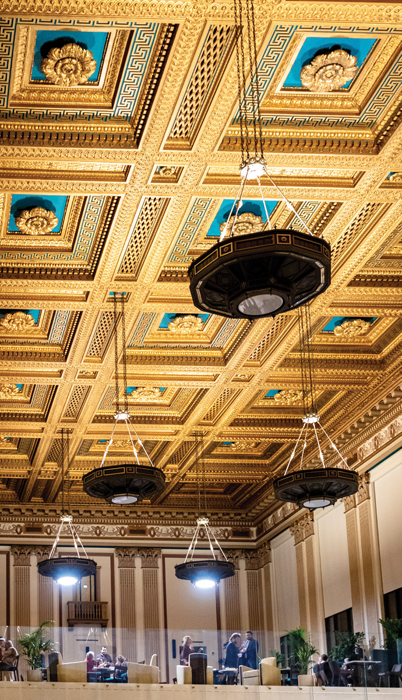 In their renovations, The Bank’s owners took pains to protect and celebrate the original beauty of the historic building, which is the second-oldest bank building west of the Mississippi. The result is a dramatic open space with gleaming marble floors and grand windows. In its opening weeks, The Bank is limiting its business hours to late afternoons and evenings, but hours will be extended once all of the eateries are fully operational, likely in late winter or early spring.